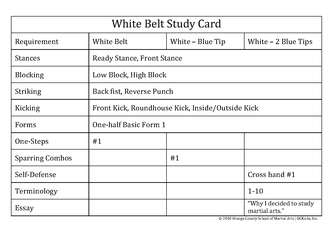 These study guides contain training information and step-by-step descriptions of techniques practiced during class. 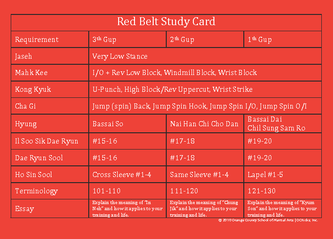 Refer to these guides when practicing techniques at home. For testing requirements click on the menu link for your current belt color. 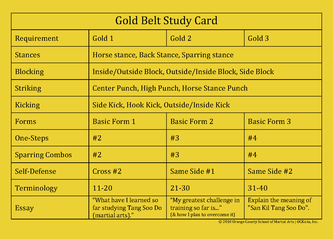 These study cards list knowledge and demonstration requirements for advancement to the next rank. On the back of the card you can keep track of your attendance and have an instructor or assistant instructor "sign off" on individual requirements. Proper demonstration of forms required for each rank are available on the San Kil Tang Soo Do website via YouTube. For a written description see the Hyung tab above. Studying martial arts is not all kicking and punching. The founder of Tang Soo Do, Hwang Kee, encouraged all of his students to become warrior-scholars. We continue this tradition by asking that students write about their experiences in martial arts as a means of examining the Art and themselves. Listed below are the essays required to advance in rank (i.e. White Belts will write their first essay on "Why I decided to study Tang Soo Do" to advance to Gold Belt). Essays should be handed in prior to the test date (one copy) and emailed to SBN Gilliland. If you have failed to turn in a previous essay (or previously received a double promotion) you should provide additional essays for the missing topics. Don't forget to include the title, your name and test date on your essay submission. Note to Parents: If your child is still learning to write, you can "interview" them about the subject and record their responses. Why I decided to study Tang Soo Do (martial arts). 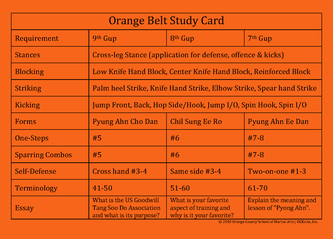 What I have learned so far studying Tang Soo Do (martial arts). My greatest challenge in training so far is... (and how I plan to overcome it). What is the US Goodwill Tang Soo Do Association and what is it's purpose? What is your favorite aspect of training and why is it your favorite? What are the responsibilities of a Green Belt? 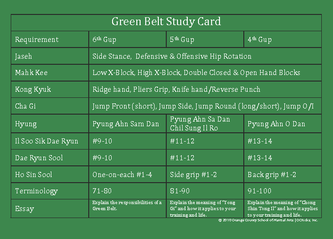 Explain the meaning of “Yong Gi” and how it applies to your training and life. Explain the meaning of “Chong Shin Tong Il” and how it applies to your training and life. Explain the meaning of “In Neh” and how it applies to your training and life. Explain the meaning of “Chung Jik” and how it applies to your training and life. Explain the meaning of “Kyum Son” and how it applies to your training and life. 1. Explain the meaning of "Him Cho Chung" and "Wan Gup" and how it applies to your training and life. 2. Explain the meaning of "Shin Chook" and how it applies to your training and your life. 3. These are the goals I plan to reach by the time I test for EE Dan (2nd Dan).